Azure, a downward opened horse-shoe Argent with a cross former of the same charged on the edge of its arch. Inside the horse-shoe an Argent arrow whose downward point protrudes. For a crest out of a ducal coronet a vulture's wing with an Argent arrow shot through. Some state that the origin of the coat of arms originated in the war of the King Bolesław III Wrymouth (1102-1139) against Prussia. A knight Dolega, the Pobog Arms bearer, shot an arrow that killed the Prussian leader. This led to the people of Poland to rise up to attack. 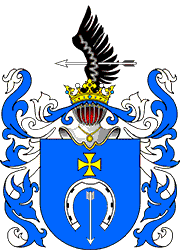 As a reward Dolega received the arrow to its Pobog Arms, and the new Coat of Arms was called after him.